After the NIN/Soundgarden tour, I intended to take a decent break from the archive and focus on other interests for a bit. After the overwhelming response of all the tapers in the last year who have contacted me and sent me in tapes/recorded the recent shows, it's time to take a slight break! But seriously, thank you for everyone who taped. The response was amazing and I know that there are thousands of people out there who have enjoyed the recordings that are up on the archive that they were able to grab here and relive the experience. Of course this break does not mean that I won't answer tweets/emails. If you have recordings you'd like to share with the archive you can always tweet me on twitter @ninlive, or email me! Just the updates won't be as rapid as they were during the tour. This article is to highlight the last year of touring for Nine Inch Nails, and also How To Destroy Angels from early 2013. Links below, are what I believe are essential recordings from the past year (all subjective) of touring. Have I listened to every tape from the last year? Of course not. In running this archive, I have almost 1,000 sources to go through! As many NIN fans can agree, there is something about Nine Inch Nails live that is special. Everyone can describe it differently. 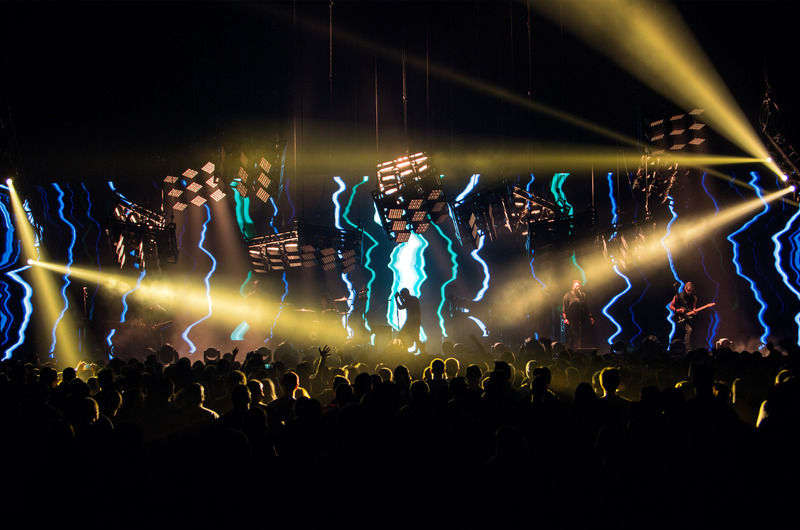 Some people like the agressiveness of the music in a live setting, the interactive light show that is always cutting edge, the perfection of the performance, the list can go on. But it's why so many get hooked and need to see them perform more than once in a tour. Whatever the reason, this list is to show it off. I was so excited when I heard NIN would be touring again back in February 2013 that would also include an album (Hesitation Marks). But before that even begun, Trent's side project, How To Destroy Angels with his right hand man in the studio, Atticus Ross, wife, Mariqueen on vocals, art director Rob Sheridan, and NIN/synth master Alessandro Cortini were hitting the road for a few shows around the United States for a mini-tour. This was the first type of touring that any of them had done since 2009. It was new, it was exciting. I was ready to see how the songs from the albums translated to a live setting. 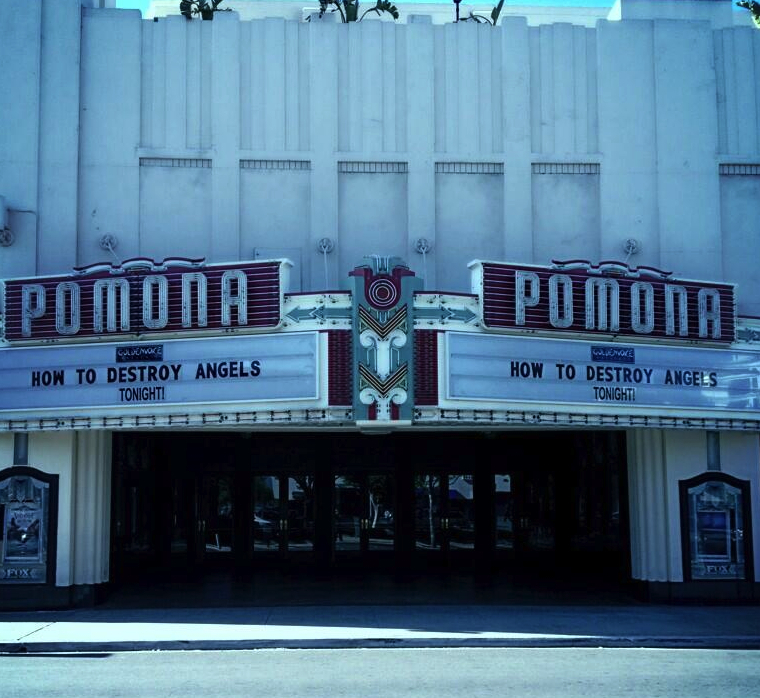 The first HTDA show took place at the Fox Theater in Pomona, CA. I remember waiting and looking at live recording trackers religously hoping someone taped the show. Less than 24 hours after the concert, a good friend of mine, Mixter, uploaded his recording from the show! I had this recording on loop for a good week. The songs sounded even better live. Most notable was "Parasite" with Reznor on the guitar just hammering the notes, and also the rework of "The Space In Between" by Alessandro's, SONOIO persona. With the show being performed at just about 80 minutes, it was a lot of material for a new band with a few EPs and one album. The recording is great as well. Mixter captured the performance well for the first night of the tour. The Pomona show was basically a warm-up to what was their biggest show they would perform on the mini-tour just a few days later, Coachella. Just like when NIN performed at Coachella in 2005, this was the first big show for the band since coming off their hiatus. The show was also live streamed on YouTube for the world to see. Something that was not around much, or available, for festivals to do with ease at is it is nowadays. It was a chance for many to see the very well crafted stage setup that HTDA would be touring with during the mini-tour. The surgical tubing that was in front of the band that gives a certain barrier between crowd and musician.. The YouTube live stream was captured in all its HD glory by some nice users over on ETS, as well as ripping the soundboard audio from the stream. This is also the same recording that Trent linked from this very site during his reddit Ask Me Anything interview in December 2013! The show in Chicago was probably the most memorable. One, because I was there and two, I was able to film the show for the band with about 6 other tapers. I contacted about ThisOneIsOnUs a few weeks before the show to see if they would have any interest with organizing/filming the show with me. Thinking we'd get a few other tapers involved and that would be it, I got a whole different response from TOIOU. We rented 5 high end professional cameras and HTDA was interested in us filming for them! We were able to get in early to setup and hear soundcheck. It was a surreal experience to be able to record for my favorite band. The footage came out excellent (screen cap below) and the edit is finished. Just need to stitch it up and there are a few other things we are waiting on before we can release it. Trust me, when I know more, I will let you know! But this was seriously the highlight of 2013 for me. After the HTDA tour, there were a few months off before NIN would hit the road. The lineup was initially going to be different. With the addition of Eric Avery, and Adrian Belew, there was certainly a buzz around this new lineup of the band that included Ilan Rubin and Alessandro Cortini. But, after a few weeks of rehearsals, both new members had left the band for reasons unknown. This brought back guitarist, Robin Finck and Telefon Tel Aviv's, Josh Eustis. I'll fast forward a bit to during the Festival 2013 run of shows. I received an email from someone who said they had a soundboard copy of rehearsal audio. Thinking it was a joke, I half-heartedly replied. But when I received a message back with a sample.. I needed it! These rehearsals were done some time in June when NIN was rehearsing for the festival run of shows. It was released by someone on the inside, and all of this came out the time that 'Hesitation Marks' was being leaked as well... When it rains, it pours. BUT, without a doubt, this is a must for any NIN fan. Over two hours of raw soundboard audio and although rehearsals, you would think they'd already had 100 shows under their belt! Obviously, the first NIN show at Fuji Rock Festival was everyone was anticipating most in 2013. 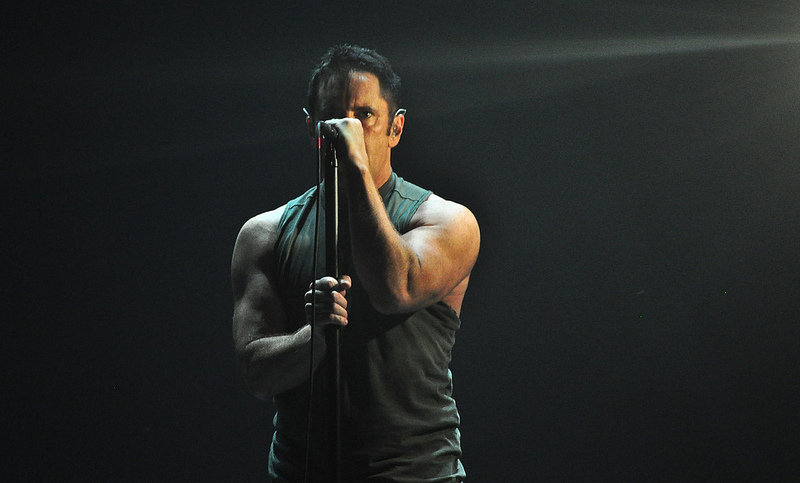 It would be almost 4 years since the last Nine Inch Nails show at The Wiltern in 2009. What would be played? New songs? A bunch of questions that needed to be answered. Thankfully, the show was streamed online, but regionally blocked to Japan. 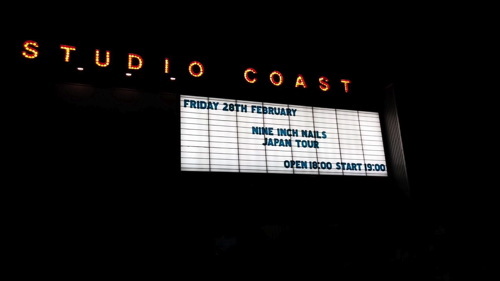 Many NIN fans sought out proxies in order to watch from their native countries. Trent walks out to a deserted stage with just a light and MIDI controller to start the first performance of "Copy of A." One by one the members of NIN came out in a Kraftwerk-like setup... NIN was finally back, and it was good. The new songs were interesting, different from what was heard on previous albums. Fresh. But the intensity of the performance was still there, and the execution of the songs. Fans who captured the performance had numerous errors/glitches in their captures to where it was not presentable. Until C. Morris contacted me to say he captures the show perfect from start to finish. We got the capture and posted it to RITC immediately, the torrent was downloaded thousands of times. In 720p and the soundboard audio mix is fantastic. Great way to kick off the 2013 festival run. There were a bunch of live streams throughout the Festival Summer Tour, having their first performance in the states in Chicago at Lollapalooza and Outside Lands in California before heading over to Europe for a bunch of dates there as well. NIN performed inbetween some acts that you would necesarily put together... Ever. Leaving for some funny banter from Trent (check out the beginning of Lowlands Fest set below). Almost all of the live streams were fantastic, and in HD. Michael Patterson did a great job mixing the audio for many (if not all) the live streams. The festival round of shows ended at Made In America Festival in Philadelphia the day after 'Hesitation Marks' was released. NIN performed a few small club shows during the festival run, and right after. One show at Scala in London, and the other as a release party for the new album in Los Angeles at Troubadour. Both shows with less than 500 people in attendance and from the video clips from both shows, looked intense! The setlists were longer, and also had some heavier cuts that did not make the festival setlists. Thankfully there is one recording from the Troubadour show. It might not be the greatest (as it is from a phone) but it's better than nothing. Doesn't get much better seeing NIN in a club setting! Still looking for proper recordings from either show! NIN @ Troubadour, Los Angeles for the 'Hesitation Marks' release show. 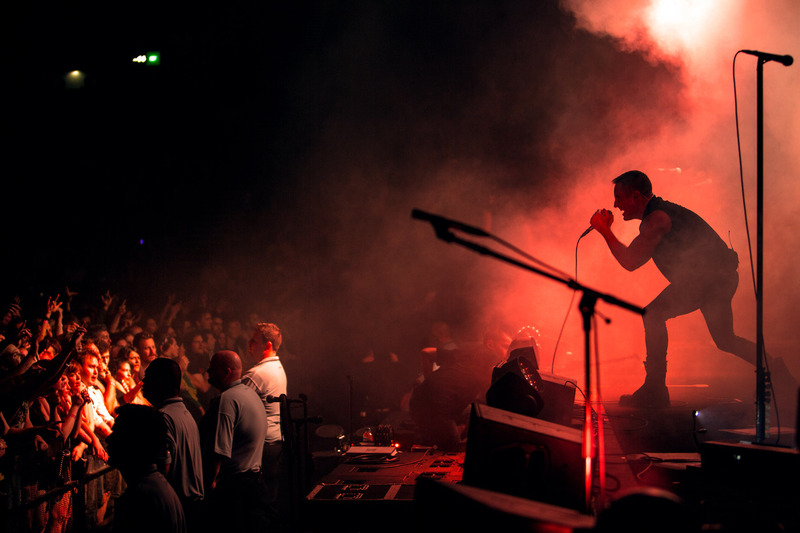 The next leg of the tour was the fall arena tour, Tension 2013. As US fans, we are spoiled with the best light show that NIN has to offer. After the Lights in the Sky Tour, where NIN took live performances to the next level with new lighting techniques and other cool gadgets (thanks to Moment Factory and the art direction of Sheridan) it was going to be very interesting to see what they had up their sleeves for this leg of the tour. Some late additions to the lineup were backup singers Lisa Fischer and Sharlotte Gibson, and bassist Pino Palladino. All of them adding another dynamic to the music. It was something fresh and new that NIN had never done before. For one, I would say that the backup singers were my favorite part of this leg of the tour. They added more depth to the songs and obviously those higher notes! The setlists had something for everyone, each album had a song or two played from it. Many of the songs off 'Hesitations Marks' were performed on this tour. As the tour went on, it seemed that more songs were added into the set after visuals were created for the songs. This could be true for "Big Come Down," "In Two," and "Sanctified." Just to name a few that I can think of. Which you could also see the sets get slightly longer. There were many great audience recordings from this tour. The most notable ones were once the band started to get out west. In San Antonio, NIN performed "All The Love In The World" for the first time live in front of an audience (as it was rehearsed for the With_Teeth Tour). 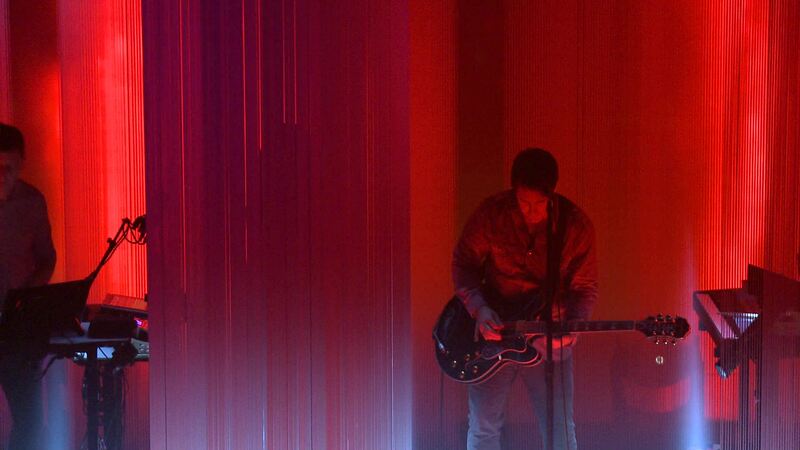 NIN also performed on PBS' Austin City Limits TV special, we have a full audience recording from the show on the archive. ACL only broadcasts an hour special, so some of the songs were omitted. The show at the Staples Center in Los Angeles was filmed by the band that will be used in the upcoming film release that will include other shows from the 2014 tour as well. It was the longest set of the tour at about 135 minutes. The audience recording done by BLG is a fantastic recording of this show. 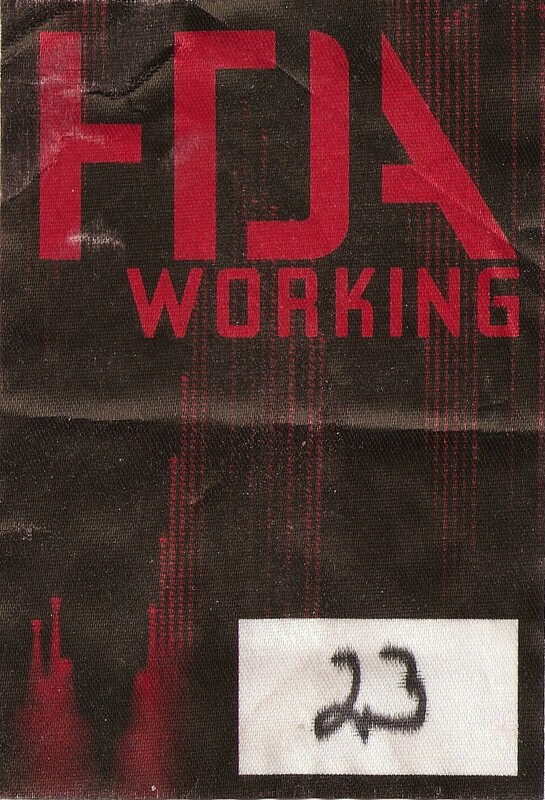 A few days after the LA show NIN performed two sold out shows at The Joint in Las Vegas. The full lighting rigs could not be installed at these shows due to the smaller stage, so these setlists varied slightly from the standard run of sets during the tour. Both nights had a nice variation of songs that were not played a lot during the tour. "All Time Low" also opened up the 2nd night in Vegas. Tapeworm48 recorded both shows and these are my favorite recordings from the tour. Tension 2013, Photo by Rob Sheridan. 2014 would start off in Japan with a few shows at Studio Coast in February. But before those shows got underway, Nine Inch Nails, Queens of the Stone Age, David Grohl of the Foo Fighters and Lindsey Buckingham of Fleetwood Mac were set to close out the 56th Annual Grammy's show. Many fans tuned in to be disappointed when the credits rolled over the last moments of the QOTSA track. As well as the band members. Everyone has heard about the tweet that Trent hit out an hour or so after the performance. But besides all of that, it was a special performance to see all of those top musicians performing together. We don't have any of the footage/recordings of the performance here on the archive, but you can find them around the internet. 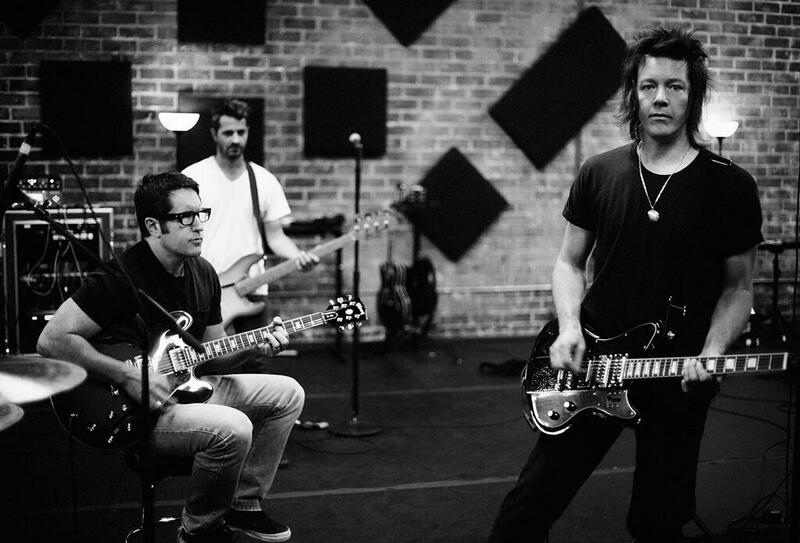 Grammy Rehearsal, Photo by Rob Sheridan. The first shows of 2014 started off in Tokyo at Studio Coast for three sold out nights. The band lineup had been altered a bit since Tension 2013, only being a four piece band with TR, Robin Finck, Illan Rubin and Alessandro Cortini. Alessandro Cortini opened up the shows with a 20 minute set and they went straight into the set from there. These shows had some of the best setlists of the year, as all three shows were different. The first night saw the debut of the main title track, "Hand Covers Bruise" from Trent Reznor and Atticus Ross' score of 'The Social Network.' As well as the first time "Beside You In Time" has been played since 2006. The second night was a very heavy set, which was my favorite setlist of the whole year. "Ghosts 31" was performed for the first time since 2008 at this show, but was most notable was Mariqueen coming out for the encore to perform two How To Destroy Angels songs. The third night was more of an electronic set, performing 'Me, I'm Not,' 'The Warning,' and 'The Great Destroyer' at this show. This has not been done since Red Rocks 2008. All three shows were recorded in fantastic quality by some bootleg companies out in Japan. Thankfully, I was able to liberate the recordings thanks to a few Japanese fans. Any one of these recordings below are essential pickups for any fan. 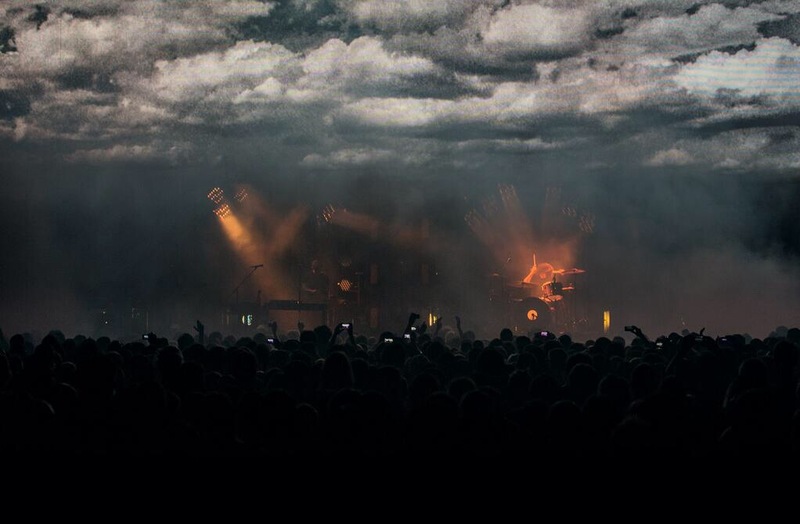 NIN Studio Coast 2014, Photo by Smores. 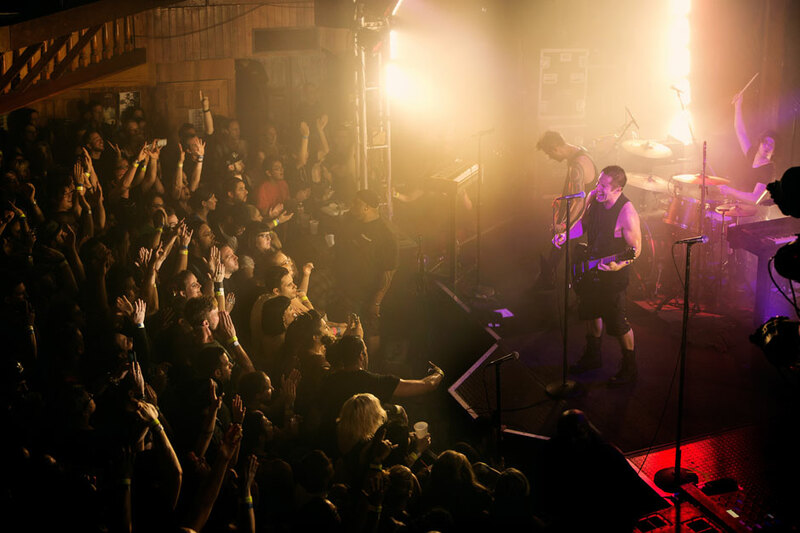 During the months of March and April, NIN toured around Australia with Queens of the Stone Age and then to South America to do a bunch of festival shows to some great crowds. For the tour in Australia with QOTSA, they would decide who would perform first with a coin flip. The tour was pretty even as to whom opened/closed. I was happy to see that a few tapes came about from this tour. Mostly to Matt G. Who taped a handful of shows for the first time. Many of the tapes are great. He has been compiling all the songs that were performed on this leg of the tour for an 'Australian 2014' DVD. Look out for that in the coming months, should be tenatively out in December. I hope to bring you more on it. The run of shows in South America had a few good live streams. But a few of them had cuts or dropouts and I am still waiting to put up propers captures/rips of the shows. The Vive Latino show was streamed on their Coca-Cola Radio app and I think it sounds the best out of them all. Trent Reznor, Australia 2014, Photo by Rob Sheridan. 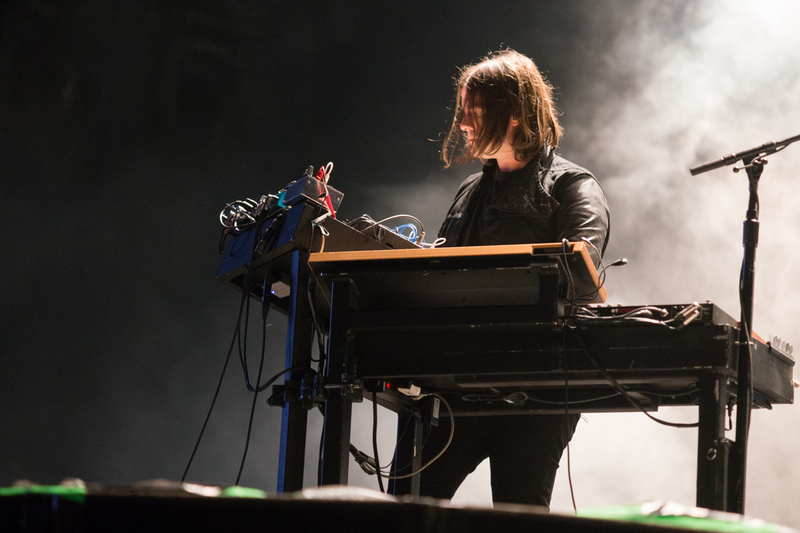 Alessandro Cortini, Vive Latino 2014, Photo by @halofive. Europe 2014 brought some new surprises for this leg of the tour. "Eraser" was brought back into the setlist. First time it had been performed since 2009. As well as a new intro mashup with "The Downward Spiral" and "The New Flesh." Since it was a headlining tour, the sets were just over 100 minutes for each show. There were a bunch of great recordings from the leg of the tour. Most notable is Ian Macdonald's recording from Amsterdam. Ian is notorious for making fantastic tapes, and this was is no exception. The other notable recordings from this leg of the tour were Stefler's recording from Berlin, Alysha's from Zurich and Mr. Ruin's from Vienna. 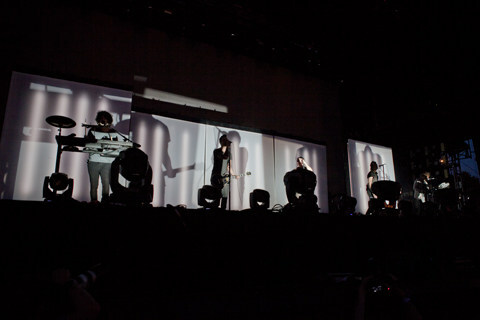 The show in Vienna was recorded by the NIN camp, which will be added together with the Tension 2013 footage for release. 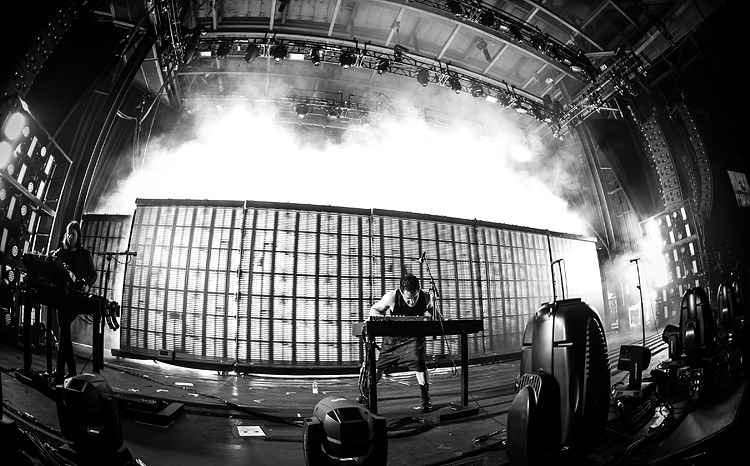 With about a months break, NIN embarked on their final run of shows throughout North America with Soundgarden. Both bands having arguably their best albums turn 20 this year (NIN's 'The Downward Spiral' and Soundgarden's 'Superunknown') it was ironic after both albums released on the same day and both bands battling for the #1 spot in the charts 20 years ago. NIN brought back the Festival 2013 stage setup for this tour. Trent had said that he was very proud of the stage design that they had for that leg of the tour and with only having two shows in North America last year. This was a great way to present it to everyone. Each band got about 90 minutes per set. NIN had two different setlists for this tour. One labeled by the crew as "Fuji" as it was similar to the Fuji Rock Festival setlist last July, and the "Assault" setlist that was full of heavy hitter songs. That setlist was rarer to see on the tour as well as "The Frail - The Wretched." Which was only played a few times. Clarkston was the only show where "The Warning" was performned on the US tour. 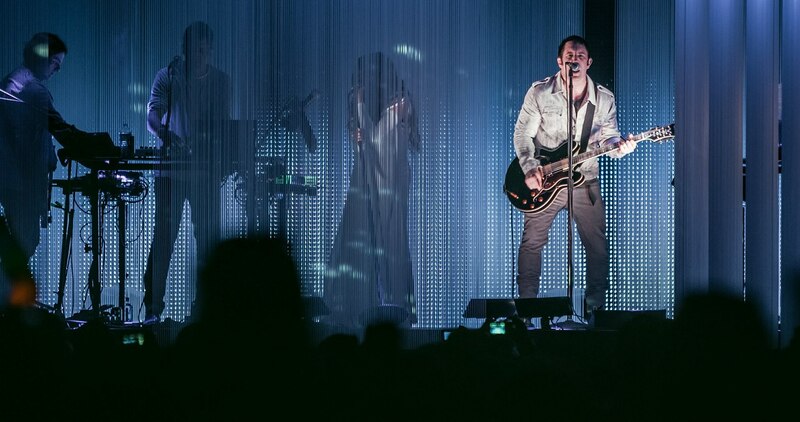 The Woodlands show at Cynthia Woods Mitchell Pavilion was filmed by the NIN crew as well and will hopefully be included in the release with the other two recorded shows earlier in the tour cycle. NIN finished the tour off on the west coast, where once again we were spoiled by the west coast crew with their fantastic audience recordings for the Cali shows. NIN then went up the cost to Portland and Seattle to close out the tour and will now be on break for the indefinite future. Trent Reznor, Clakrston 2014. Photo by Chris Schwegler. 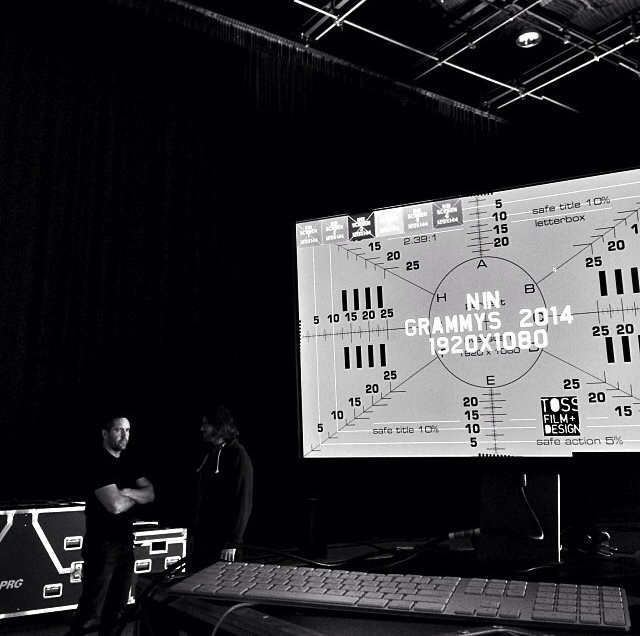 Alessandro Cortini & Trent Reznor, Clakrston 2014. Photo by Chris Schwegler. I hope that you enjoyed this article. This highlights just some of the recordings that were done while on this tour. It was hard to choose the ones that I like the most from the past year of NIN touring, as there were so many. But this should give you a few hundred hours of new shows to listen to if you were hesitant to grab any. With this break, be sure to check out the other 20+ years, and 900 audio sources that are available here on the archive. 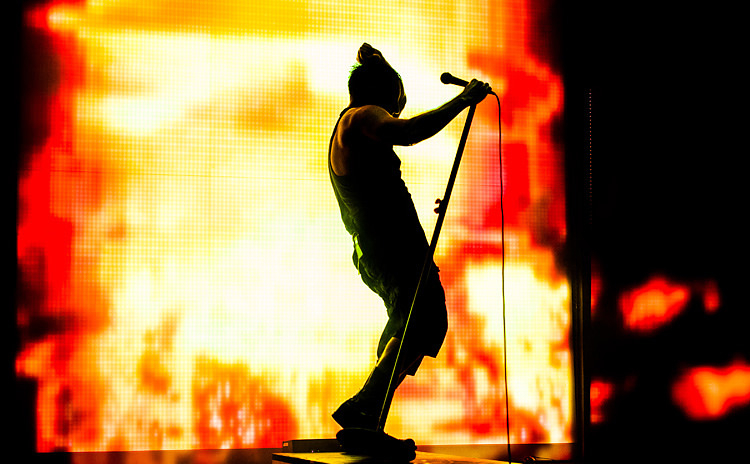 Again, I would like to take this time to thank all the tapers that recorded and sent in their recordings to be hosted and archived here at nin live. Also to NIN for once again putting on the greatest performances I have ever witnessed. If you have a recording that you would like to upload to the archive, or have a tape that is not on the archive at the moment and would like to get it to me, please email me or tweet me @ninlive. You can upload the audio/video recording to the FTP to make it easy. Or send me the tapes via snail mail for me to properly transfer digitally. Thanks for all your support over the years and hope that we can do another year in review in the near future!